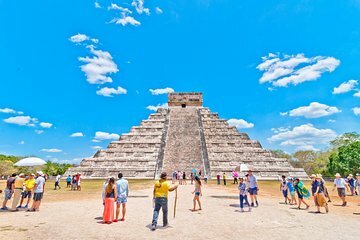 Explore the ancient Mayan capital of Chichén Itzá on this guided excursion. After a convenient hotel pickup, head to Chichén Itzá and learn about its important place in Mayan history from a specialized local guide. Marvel at its impressive plaza, pyramid, temple and other ruins, and enjoy a delicious box lunch—it’s included in the tour price. Local tax of $406 mxn. This amount is subject to change for bookings in 2020.